Wee Small, shall we say, has a more boisterous and exuberant, even rowdier temperament, than The Little One. And occasionally friction occurs. The Little One, being the eldest, has recourse to more means of diplomacy than Wee Small. So when the need arises she can take steps to avoid possible confrontations of an unsavoury nature. 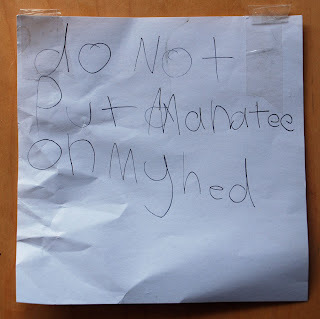 Thus this sign I found this morning that The Little One has written for Wee Small. It is a pity that Wee Small cannot read. I'm sure that The Little One has plans for teaching Wee Small to read - The Boy taught his younger sibling The Girl to read by means of similar signs: 'Do Not Waik Me Up Befor 7 Oh Clok', 'No Gerls Aloud', 'Keep Owt' and such like. 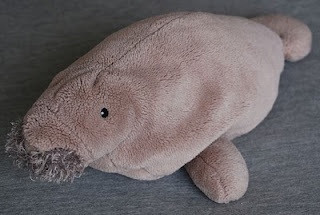 Perhaps Manatee can help Wee Small to read the sign? Im sure he wouldn't want to be responsible for an Unpleasant Confrontation. This is good stuff. I, too, need a sign like that.